This is one of my let me see what I have in the cupboards and fridge to throw supper together creations. It uses pantry staples and produce most people are likely to have on hand. 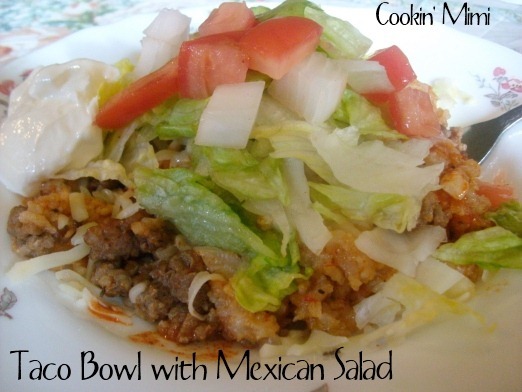 The Mexican salad part of this dish is the lettuce, tomato and onion topping. That’s what my favorite restaurant calls the salad like garnish. In a 2 quart sauce pan with tight fitting lid brown the ground beef over medium heat. Drain fat if needed. Add the rice and seasonings, cook and stir for a minute or two. Pour in water, salsa, and hot sauce if using. Bring to a boil, cover, reduce heat and simmer for 15 minutes or until liquid is absorbed and rice is tender. Remove from heat and rest for 5 minutes. Divide mixture into bowls or rimmed plates, top with cheese, lettuce, tomato, and onions. Serve with sour cream, hot sauce, and salsa if desired. Sounds great, but what’s the crockpot way??? Do you pre-cook the ground beef? I like a mushier rice – so how long did you cook it? Love your blog, great and easy recipes!! Thanks for your help. Keep cool!!! Brown the ground beef and toss everything in a 2 or 4 quart slow cooker and cook on high for 2 or 3 hours.